This stretch is also a nice fishing area. The river is relatively calm with little to no rapids. At high water expect swift currents and minimal eddies. Lots of access points give you a lot of options for day floats or even an overnighter. This is a small dirt parking lot and ramp in between Highway 95 and the river (river right). This is another small ramp and dirt parking lot but it works. There is a small community area at Elk Bend. You can access the river on the northern portion of the bend. Basic access here with not a lot of parking. This is a very minimal primitive access point. It is a steep road getting down to the river from Highway 95 and trailers are not recommended since turning around can be tough. Probably best as a fishing, kayak, IK or Canoe access area. This is a nice but primitive access point. There's usually not a lot of people here and there's a good concrete ramp. 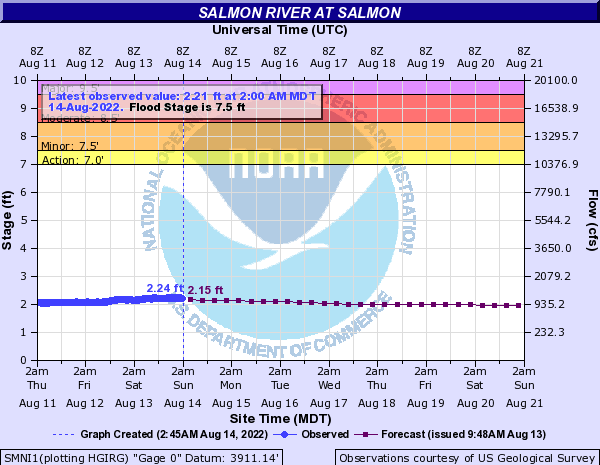 This is just south of the town of Salmon and is a pretty busy river access point. This area is very nice and has camping, concrete ramp and parking, restrooms, water and fishing access. In the heart of salmon where the river runs through town there is a small island that splits the river. There is access on this island. When floating this section, make sure to take the left channel on the left side of the island. The right channel doesn't typically hold enough water to float all the way through for most watercraft. This is a naturally occurring (almost riverwide) ledge. It has all the same characteristics as a diversion dam but it is an uplift in the bedrock and is sharp. If you know where this is it can be easily run on far left. At highwater or low flows going over the ledge could easily damage rafts or injure swimmers. Just be aware of it's existence and paddle accordingly.